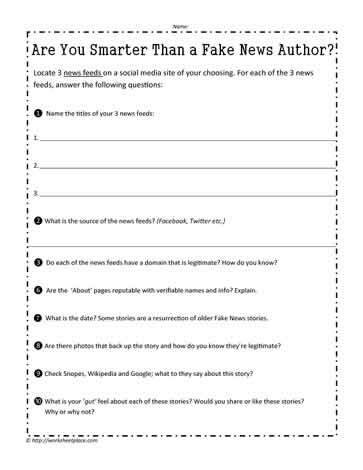 Critical thinking fake news worksheet. Do you know how to tell if news is fake or not? What is the source of the news feeds? (Facebook, Twitter etc.) Do each of the news feeds have a domain that is legitimate? How do you know? Are the ?About? pages reputable with verifiable names and info? Explain. What is the date? Some stories are a resurrection of older Fake News stories. Are there photos that back up the story and how do you know they?re legitimate? Check Snopes, Wikipedia and Google; what to they say about this story? What is your ?gut? feel about each of these stories? Would you share or like these stories? Why or why not?